The following text was contributed by the Government of France. As the former President of the French Republic François Hollande noted, France is committed to building new alliances between Government and civil society to meet the great democratic, social, economic and environmental challenges of the 21st century. Ensure accountability to improve transparency, restore trust and make better public policies. Transparency is demanded from authorities through commitments relating to public decisions, local finances and public procurement. It is also demanded from businesses, notably in order to effectively fight money laundering, tax evasion and corruption. This effort reaches the international realm with particular consideration to public development aid and international negotiations. Consultation and the co-creation of public action based on renewed participatory mechanisms to involve citizens in the making of public action. In order to modernize and revitalize our democracy, we must create the conditions for constant exchange with citizens, organizations and businesses, for instance by identifying problems in a neighborhood or through new means to elaborate the law. The citizen takes an active role in public policy evaluation. Open digital resources for economic and social innovation thanks to new means to produce and share data & calculation models. Our aim is to go further on this path with a transformation of the State’s technological resources into an open platform. Digital administration is a remarkable mean to enhance proximity and efficiency in public action. Opening up the administration itself will favor citizen engagement in support of the public sector and in schools in particular. This openness implies helping civil servants in the digital transition and reinforcing their role and protection in the prevention of conflicts of interests. Climate change and sustainable development: in the context of the COP21 conference that will take place in Paris in December 2015, the National Action Plan proposes to apply open government tools and policies to the environmental challenge, as it is one particularly adapted to these new means and principles in governance. Throughout this plan, France took a total of 26 commitments. In a year, a first assessment will be made. Lessons learned from this first plan will support the second version of the Action Plan and France’s mission as OGP Co-Chair starting in October 2015, before taking over as Lead Chair in October 2016. Throughout this process, France will strive to make constant progress towards a government that is more open to consultation and citizen’s contributions. France joined the Open Government Partnership (OGP) in April 2014. In August 2014, France was elected by its peers to join the Partnership’s Steering Committee. 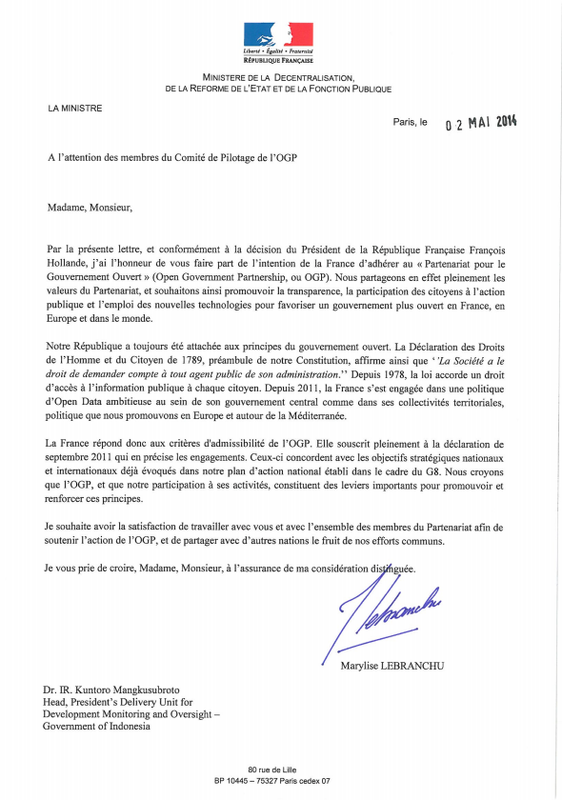 Below find France's Letter of Intent to join OGP.